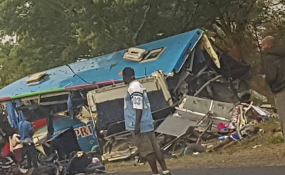 Condolences have been pouring in for victims of the horrific crash involving two buses which claimed 46 lives at the 166km peg along the Harare-Mutare Highway on Wednesday evening. The ruling party, Zanu-PF consoled the bereaved and wished the injured a speedy recovery in a statement yesterday. "The revolutionary Zanu-PF party, ably led by President ED Mnangagwa and its entire membership, has been shocked to learn of the tragic collision of two buses near Rusape where 46 people perished and several others injured," said party spokesperson Cde Simon Khaya Moyo. "This is chilling, heart-rending, horrific and unimaginable. The revolutionary party mourns the departed, consoles the bereaved and wishes the injured speedy recovery. "Those responsible for such accidents, be they owners of the buses or crew, must be brought to book. Enough is enough. Our roads cannot be turned into slaughter highways." MDC-Alliance also sent its condolences yesterday, saying it shared "the pain of the families of the deceased". "Their passing is untimely, the loss of life is sad, painful and leaves life-long negative impact not only for the families, but the Zimbabwean community," said the party spokesperson Mr Jacob Mafume. "We, therefore, express our condolences. Our thoughts and prayers are with these families. "We recommit the party to contributing to the fight against road carnage. May their families find comfort in these trying times. May their souls rest in eternal peace." UN resident coordinator and UNDP resident representative for Zimbabwe Mr Bishow Parajuli on his Twitter said, "The @UNZimbabwe team is extremely saddened by the Rusape accident and loss of so many lives: Our deepest condolences to the loved ones for the loss of life and prayers for the speedy recovery of those injured." Losing presidential candidate Dr Nkosana Moyo on his Twitter handle said, "I would like to convey my condolences to the bereaved families after the unfortunate bus accident in Rusape which claimed 47 lives. May they be comforted and strengthened through this trying time. I urge all drivers to be cautious and more so especially as we enter the festive season." The Embassy of Canada said: "The Embassy of Canada in Zimbabwe offers its sincere condolences to the families and friends of those killed in the recent bus accident near Rusape, and hopes for the quick and full recovery of victims injured by the crash." CBZ Holdings said, "Every breath we take is a priceless gift of life we ought to cherish every day. "Our deepest condolences to all families who lost their loved ones violently in the Rusape road accident yesterday, may their souls rest in eternal peace." On its Twitter account, the National Blood Service Zimbabwe (NBSZ) said, "Our heartfelt condolences to all families who lost their loved ones in the Rusape road traffic accident. We wish all the injured a speedy recovery. "Let's reduce the burden of death and injury to our society this festive season; drive safely and donate blood to save lives."